Shiny metal jingle bells for Christmas crafts. Measure 45mm (1-3/4 inch) in diameter. Include top loop for hanging. Shiny metal jingle bells for Christmas crafts. Measure 35 mm (1-1/4 inch) in diameter. Include top loop for hanging. 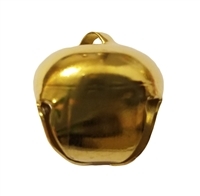 Metal jingle bells measure 30 mm (approximately 1-3/16 inch) in diameter. Include top loop for hanging.